The Washington State Department of Agriculture has recently reported that three horses tested positive for Pigeon Fever near the towns of Duvall and Carnation. A 15 year old Paint gelding, 14 year old Haflinger cross gelding, and a 25 year old Tennessee Walker mare are currently under the direct supervision and treatment of a veterinarian. Though historically uncommon here in the Puget Sound region, the disease has started to spread to our area and we wanted to provide you with some fast facts about Pigeon Fever (and no, it doesn’t involve the bird). Commonly called pigeon fever, this disease is caused by the Corynebacterium pseudotuberculosis bacteria and can affect equines, cattle, goats, sheep, buffalo, camelids, and rarely humans. The infection is so named because, in a majority of cases, horses develop a swollen chest which can resemble the protruding breast of a pigeon. It is believed to be transmitted through the bites of contaminated flies as well as introduced through abrasions or wounds in the skin via contaminated insects, direct contact with contaminated soil, or contact with pus from an infected horse’s abscess. Ventral midline dermatitis (“sweet itch”) is believed to be a predisposing cause of the infection as well. There are three forms of C. pseudotuberculosis infection typically seen: external abscesses, internal infection, and ulcerative lymphangitis (limb infection). External abscesses are the most commonly seen form and frequently are seen in the pectoral (chest) region and along the ventral midline of the abdomen. They can also be present in the prepuce, mammary gland, tricep, axilla, legs, and head. Horses can have one or more abscesses in different areas of their body. The abscess contains a thick, tan, odorless purulent exudate (pus) and requires lancing and draining by a veterinarian when mature. 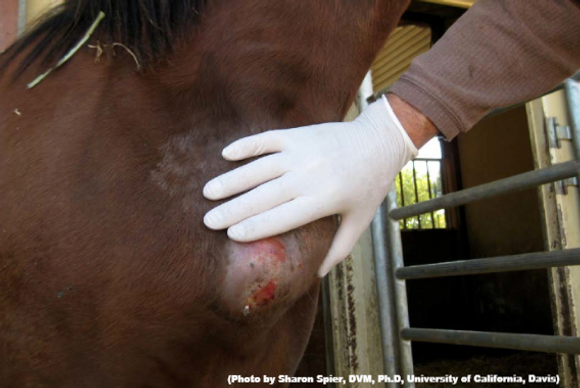 Typically horses with external abscesses do not develop signs of systemic illness, though 25% will develop fever. Antibiotics are usually not indicated unless signs of systemic illness are present or if there are very deep intramuscular abscesses draining through healthy tissue. The fatality rate in horses with external abscesses is very low (<1%). Internal infection is seen in less than 10% of horses, and typically involves abscesses on the liver, kidney, spleen, and/or lungs. Affected horses typically display inappetence, weight loss, fever, lethargy, abdominal discomfort, and/or signs of respiratory disease. Treatment involves long-term antibiotic therapy, usually for at least 4-6 weeks, and supportive care. Internal infection has a higher rate of fatality (30-40%). Ulcerative lymphangitis is uncommon in North America and is characterized by severe limb swelling and cellulitis, typically in one or both hind legs. Frequently the horse will be severely lame and have fever, lethargy, and inappetence. Affected horses are treated aggressively with antibiotics and anti-inflammatories to prevent the disease from becoming a chronic issue, as well as hydrotherapy (cold hosing), hand walking, and leg wraps. Diagnosis is based on a combination of clinical signs, blood work, diagnostic imaging (abdominal ultrasound), and bacterial cultures of the abscesses. Biosecurity measures are the best way to limit the spread of Pigeon Fever, focusing on limiting environmental contamination and spreading of the bacteria via insects or objects. Unfortunately the bacteria is hardy and able to survive in hay and shavings for up to two months, and in soil for over eight months, especially if it is contaminated with manure. Previously believed to be a disease of California and the Southwest, pigeon fever has been diagnosed in horses throughout the United States and is being seen year-round. Unfortunately, click to continue reading article and to view video. Click to sign up at equinediseasecc.org for outbreak alerts. Click to view Tacoma Equine Hospital website.